GARY Shaw arrived at Victoria Park in 1983 as one of the country’s most sought-after rovers. He left it at the end of four seasons as one of the unfortunate scapegoats for the largesse of the New Magpies, who had staged the most audacious and expensive recruiting campaign in the club’s history. Shaw’s 32 games – and 33 goals – for the Magpies was hardly the return he or those who recruited him expected. Making it even less palatable was the fact his transfer fee alone cost the Magpies more than $300,000 – the equivalent of half a dozen Melbourne suburban homes at the time. But that he was considered the centrepiece for blame for Collingwood’s financial mess by the mid-1980s seems unfair, given other players had also cost the club a small fortune, and that it was the administration – not the players themselves – who were so profligate with their money. Besides, the speedy and skilful rover – a Queensland native who had dominated in two seasons in the WAFL before signing on to play with Collingwood – failed to make a lasting impression in black and white largely due to a host of injuries he encountered. Shaw’s father had played for Western Districts (now the Western Magpies), in Queensland, and football always played a significant part in Gary’s upbringing. Always a diminutive rover, he was considered too small for the Queensland under-15s team in 1976, with selectors overlooking him from the team as a result. Yet when he trained for the state’s under-17s Teal Cup side in the same year, he was not only selected, but won the award as the most outstanding Queensland player, as a 15-year-old! He showed talent from a very early age, playing his junior career with Sherwood (also in black and white colours), where incredibly he never played in a losing side. That winning streak stretched from his first year in the under-9s all the way through to his second year in the under-17s. Shaw more than held his own in what was an outstanding Claremont team in 1981, which included the Krakouer brothers (Jim and Phil), Brownlow Medallist Graham Moss, Stephen Malaxos and a host of other players who would go onto VFL careers. He had 21 disposals for Claremont in the 1981 grand final and was adjudged as joint Simpson Medallist, alongside South Fremantle’s Maurice Rioli. He was even better the following season, winning Claremont’s best and fairest award in 1982, and finishing a narrow runner-up in the Sandover Medal. He also represented Western Australia, and by season’s end was considered the best rover outside the VFL. Today his name is considered a byword for the profligacy of the New Magpies era, but back then he was genuinely hot property. In the west he was considered to have electric pace, and his spearing passes to leading forwards were said to be things of beauty. He used the ball well, got plenty of it, and seemed to have all the ingredients needed to make it in the VFL. Collingwood was the club chasing the hardest for his services, desperate for a classy rover. Shaw looked to be the perfect fit. But he came at a cost. At a time when it seemed as if money was being thrown about in the VFL almost as if it was confetti, Shaw’s transfer fees alone were more than $300,000. That wasn’t his fault, but the expectation coupled with the price tag put significant pressure on the 24-year-old, who once described himself as “a bit of a clown” when he moved to Melbourne. From the outset, there was talk of locker-room discontent at Collingwood. He started as second rover to Tony Shaw, and played well early, without being outstanding, kicking a goal in each of his first five matches and nailing three in Round 4 game against Essendon. But a stress fracture in the shin ruined the rest of his debut season. Shaw enjoyed a solid 1984, kicking five against North Melbourne and starring in several other games as he managed 19 games for the season. But solid wasn’t enough: the club had paid big bucks for a star, and occasional good games were never going to keep the critics at bay. Injuries – often cruelly timed – frustrated him throughout 1985 and again in 1986. 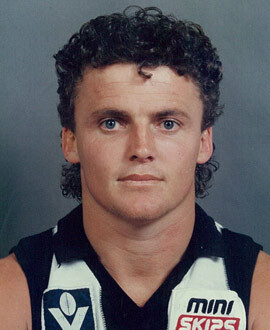 By the end of 1986, it was clear Shaw’s time at Collingwood was over. He was one of three Magpies who the club had nominated as being made available to the newly formed Brisbane Bears. He agreed to a three-year deal with the Bears, but lasted only one. He played six games in 1987 before his body again failed him, this time with a back injury, before playing out most of the season with his old club Western Districts. The Bears tried to convince him to play on, but Shaw had finally had enough. The grind of all those injuries, and the weight of all that pressure, finally got to him, and he retired at the age of 28.